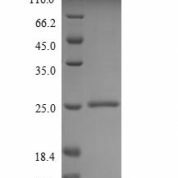 Recognizes a single glycoprotein of 520kDa, identified as mucin 2 (MUC2). 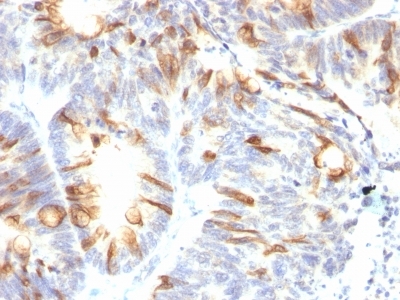 This MAb shows no cross-reaction with human milk fat globule membranes, MUC1, or MUC3. Its epitope has been defined as GTQTP (GlyThrGlnThrPro). 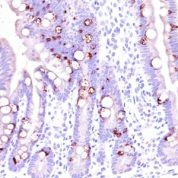 Mucins are high molecular weight glycoproteins, which constitute the major component of the mucus layer that protects the gastric epithelium. 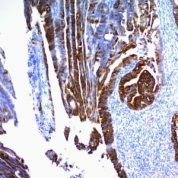 MUC2 is specifically expressed in goblet cells of the small intestine & colon; in about 65% of colonic carcinomas, about 40% of gastric carcinomas. 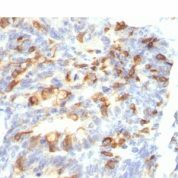 MUC2 is rarely expressed outside of the GI tract with the exceptions of mucinous carcinoma of breast, clear cell-type carcinomas of the ovary.